Build a magic trick that uses the micro:bit’s compass to detect a nearby magnet! This is a simple magic trick you can perform to amaze your friends! When you move the sticky labels on your micro:bit’s A and B button, you appear to make the buttons really switch over. To see the trick performed watch the video below. The magic here is really in the code. This trick uses a magnet, hidden in your hand, to tell the micro:bit to swap over the buttons. When the magnet is near the micro:bit, the A button starts working like the B button and the B button starts working like the A button. Tricky! Now we can measure the magnetic force near the micro:bit. We can check if the value we measure is so big that it means there must be a strong magnet nearby. If you’ve ever played with magnets you know they have two ends, often called a North and South ‘pole’. 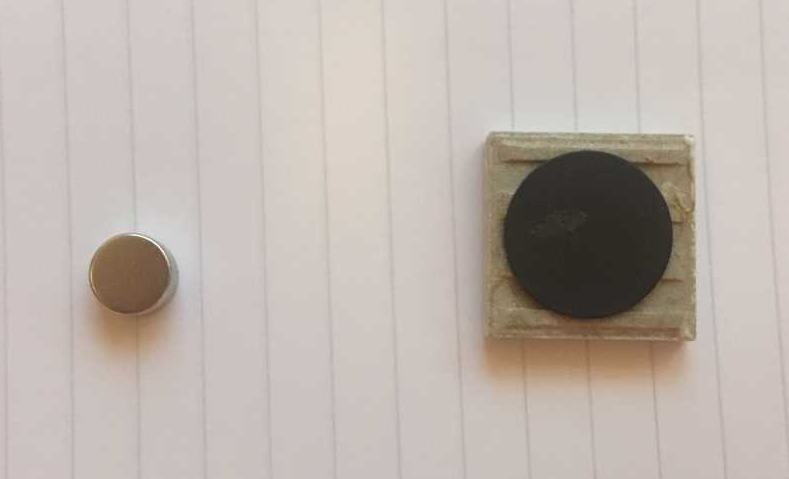 Depending on which end of the magnet is pointing at the micro:bit, the magnetic force measurement will either be a negative number (like, -100) or a positive number (like, 100). We just want to know if the strength is at least 100. We don’t care if its negative or positive so we also use the absolute of block from the Math menu to tell our code to ignore the negative sign and just treat -100 as if its 100. At the moment, our code to detect a magnet being nearby will only run once. We need to put it into a forever loop so that it keeps running again and again, checking for the magnet to come near to the micro:bit. We should also make sure isSwitched is set to false when our program starts. Now you just need to program your own micro:bit and practice the trick a few times before performing for your friends. Try asking your friends to click the buttons after you have switched the labels and the trick won’t work for them because they don’t have a hidden magnet in their hand! Remember, that as we are using micro:bit’s compass, it will need to be calibrated each time we flash the program or run it for the first time. This project was contributed by Brian and Jasmine Norman, aka @MicroMonstersUK. You can checkout their MicroMonsters tutorials channel on YouTube for more projects.